Ah! There is no feeling quite like that first cup of coffee in the morning that helps you to start your day off right. This vape juice blend is able to seamlessly recreate that amazing coffee flavor that you usually have to head to the local shop for but in an even more convenient, equally delicious way that is going to shave a lot of time off of your usual, rushed morning routine. Look, there is nothing worse than having to wait in long line up just to pay an arm and a leg for a cup of your favorite beverage just to find out that you've got the wrong order. We have all had those days where we have had to skip out on this necessity and it completely threw us off of our game. It's like you're in this constant haze until you are finally able to get a few moments aside to enjoy that wonderful nectar that we all flock to for a little bit of that extra drive to help us knock all of our goals out of the ballpark. Every day is going to have that positive kick start that you need without any of the stress and struggle of having the real thing now that you have a juice like this around. 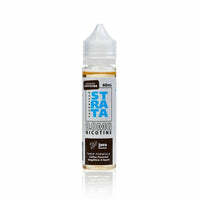 Strata Salt E Liquid makes a wide range of vape juice blends that are going to appeal to just about any vaper out there, all of their products are made with salt nicotine that packs so much more nicotine into every inhale for a satisfaction like you have never had before. Java has that strong, earthy coffee taste that you know and love with a silky smooth texture that will have you letting out a sigh of pleasure every time that you hit the fire button.